When you create a social network on Ning, you have full control over which features you’d like your social network to have. 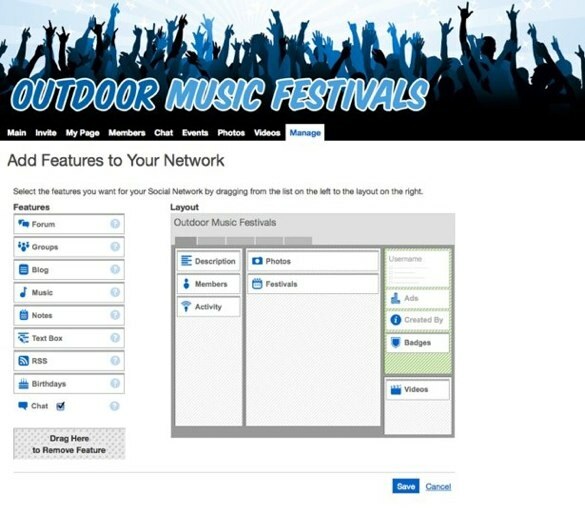 You can choose fromÂ about twenty features, fromÂ PhotosÂ toÂ EventsÂ toÂ ForumÂ toÂ Latest Activity. You may already have a specific idea of which features you want on your social network right from the beginning. That said, we’ve seen most successful social networks launch with the same specific features, gradually adding in other features as the social network grows.Â The features that helpÂ brand new social networks grow the most areÂ Photos,Â Videos,Â Latest Activity,Â Members, andÂ Events. These features contribute to the social network’s success because they are visually pleasing, fun to use, and easy to interact with. MakeÂ PhotosÂ andÂ VideosÂ the focus of your social network, at least initially.Â These are two of our most popular features in terms of usage across the social networks on Ning. Making these the primary experience has a higher probability of success than other combinations of features.Place the photos and videos features front and center on your social network’s main page. Putting these features in the top section of your social network, making them the first things people will see when they visit, will make people more likely to stick around.Â Photos and videosÂ add to the visual appeal of your social network and are extremely easy and funÂ for members and visitors to interact with. Use theÂ Latest ActivityÂ featureÂ to drive recurring usage by members on your social network, especially as you get bigger.Â The Latest Activity feature is a gauge of how active your social network is, and is a great way for all social networks, even those just getting off the ground, to highlight whatâ€™s new and motivate members to participate.We recommend keeping the Latest Activity feature on the upper-left hand column of your social network, especially if you have a popular network. People join and keep coming back to social networks because there are a ton of things going on. Don’t be afraid to get things started in the Latest Activity feature by adding some content yourself and asking a few friends or colleagues to do the same. A lot of variety shows that your social network really is a happening place, and encourages people to click around and explore even more. Keep yourÂ MembersÂ section prominently displayed on your main page, preferably in the upper left-hand side of the main page.Â People love people and enabling people to get a quick, visual sense of whoâ€™s on the network encourages more people to join. We strongly recommend against removing the Members box from the main page of your social network.It’s a good idea to take advantage of the ability to feature members, meaning you can choose exactly who appears in the Members box on the main page. Choose members who represent the types of people you want to attract to join your social network, and people who’ve uploaded nice looking profile photos. Showing the friendly faces of the various people who are members of your social network instantly makes your social network feel more personal and attractive to prospective members. Launch with theÂ EventsÂ feature, provided there are relevant events related to your topic that you can add.Â This featureÂ helps social networks just getting off the ground because it’s all about getting people together.Â It doesn’t require much work for you to add a bunch of relevant events to your social network, and in contrast to other features, it doesn’t really matter if you’re the one creating all the events to begin with.Â Add events that your audience might be interested in from a number of different sources, whether or not the events are already listed elsewhere. 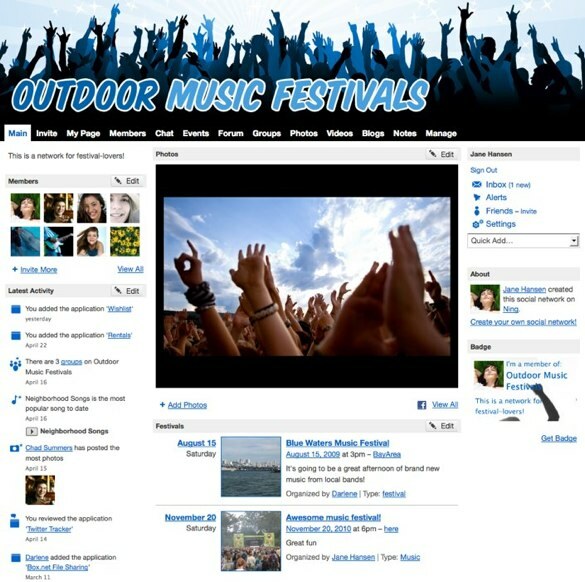 If you can consolidate events listings from several websites or sources, you’ll provideÂ valuable information forÂ members and prospective members.Another benefit of launching with the Events feature is that once an event’s date has passed, it will “expire” and no longer appear on the Events page on your social network. This means that your network won’t look stale and inactive because outdated events will automatically be removed from the events listings. If you have time to devote to it, theÂ ForumÂ feature is a great way to encourage interaction between members and get people talking about your topic. You can nurture your Forum by periodically starting a few discussions relevant to your social network’s topic and asking a few friends or colleagues to genuinely participate in the conversation. This doesn’t mean adding one response one time; this means getting them to have a lively and active discussion right in the Forum.IfÂ you won’t be able to nurture your social network’s Forum, it can be a bad experience when your social network is just getting off the ground. For example, if you start a bunch of discussion threads without responses, or don’t keep the conversation going, it tends to make your social network look empty and dead. You can always add this feature in as members join and it becomes clear that they want to interact. Text boxesÂ are another feature that may work very well for you, but aren’t necessary to launching a successful social network. A couple of great uses for text boxes include featuring an important video, adding some introductory information about yourself and the social network, or creating a welcome center for new members. RSS feedsÂ can help keep the main page of your social network fresh when you’re just starting out. If you can find an RSS feed that’s relevant to your social network’s topic, you might want to place it in the lower part of the main page. Because RSS feeds automatically update, this will make your social network look more active and add newness to the content on the main page.